Sad news tonight…..actress Beatrice Arthur has died at the age of 86. 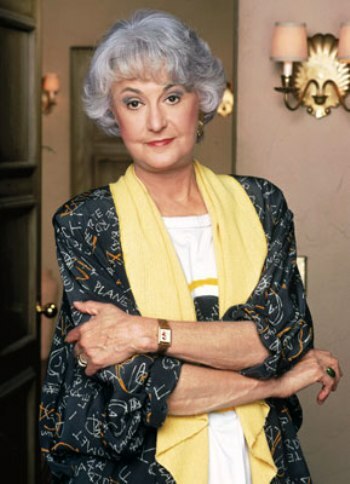 I know Bea Arthur as Dorothy Zbornak on NBC’s Golden Girls from 1985 to 1992, but older generations know her most as Maude, a spinoff of All in the Family. Maude, which debuted on CBS in 1972 (and ran until 1978) was a spin-off of the hit All in the Family. As the liberal cousin of archconservative Archie Bunker’s wife Edith, the much-married Maude wasn’t afraid to broach such controversial (especially for TV at the time) topics as abortion and civil rights. Golden Girls, a popular NBC Saturday-night staple from 1985 to 1992, featured Arthur as the outspoken Dorothy Zbornak, who shared a Florida home with three other women, including her mother, played by Estelle Getty – who died last July, at 84. The other stars were Rue McClanahan and Betty White. next post: NBA’s Derek Fisher Has an “Obsessed” Stalker In Real Life. 50 queries in 0.699 seconds.